The course is designed to introduce theoretical and practical applications of financial futures, options and other derivatives such Swaps, Swaptions and FRAs. Over the last 30 plus years, with the expansion of hedge funds, the markets for these asset classes have grown enormously and has generated innovative techniques for hedging, speculating or arbitraging investments. 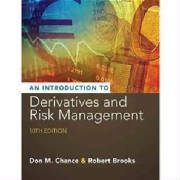 Derivatives have become one of the most important tools of modern finance. We will examine the institutional aspects of futures, options and swap markets and provide an analytical foundation for the pricing these instruments. The subject matter requires relatively greater use of quantitative methods including the binomial option pricing model as well as the classic model of Black-Scholes-Merton.